Heavy equipment hauling is serious business. It takes a dedicated team all working cohesively to get the job done safely and promptly. 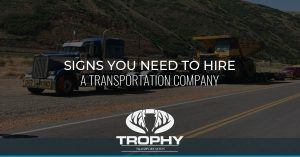 In these posts, the Trophy Transportation team will be discussing some of the knowledge, equipment, and experience that has led to us specializing in heavy haul transport as well as what sets us apart from other heavy haul trucking companies, allowing us to handle even the largest of operations with safety and professionalism. Find out about the variety of heavy equipment hauling we have experience with and reach out to our friendly team with your superload needs!